I found this flag when I went to the surplus store. The guy told me that he got it from a soldier who came back from Iraq. Any idea of what the writing is and what it is for? I found out that this is Saudi Arabia flag. Tss tss, it took me 3 seconds to find the translation ! you'd better do more research guy ! 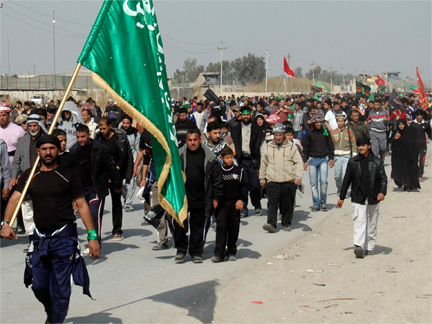 Saw it many times... it's a Mahdi Army flag....Green for Shiite...The Mahdi Army (or JAM-Jesmail Al-Mahdi) are the militia in Sadr City which was Saddam's Shiite ghetto. I spent a year there. They follow Muktada Al-Sadr (The guy you see on TV with the black turban on) . Sadr City is named for his grandfather who Saddam executed. He is militarily the most powerful man in Iraq since only Iraq and Iran have a Shiite majority of any Muslim country. All the others have a Sunni majority. 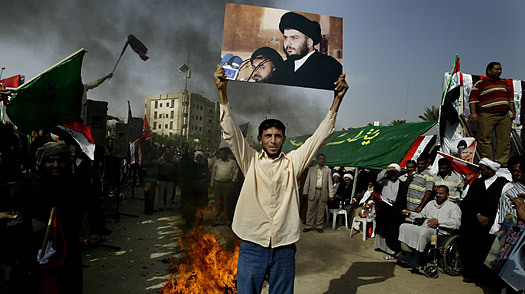 Only 10% of all Muslims world-wide are Shiites- almost all live in Iran-Iraq. The big fear is that the 2 counries will unite into one big Shiite country. ok ok, I think there's small difference. The one you have is well Saudi Arabia. The other islamic flags doesn't have the sword I think. The wikipedia link say the same thing :"Green flags bearing this or other Arabic scripts are frequently seen in Islam and should not be confused with the Saudi national flag. These other flags normally do not bear the sword symbol." Jubilant Iraqis carry a flag of the militant Mahdi Army and a national flag after U.S. troops dismantled checkpoints around Baghdad's Shiite enclave of Sadr City. Iraq's Prime Minister Nouri al-Maliki ordered the lifting of joint U.S.-Iraqi military checkpoints on Tuesday. For me, the flag you have is well Saudi.